My family took all holidays quite seriously but it was Christmas in particular that brought a level of bliss to my parents like no other time of the year. Candles and wreathes weren't just placed every window, we had garlands up the banister and on every chandelier, two massive trees decorated to the point where every single branch bent downward from the weight of an ornament, each table surface was covered with candles and holiday themed knickknacks, and the centerpiece to it all was a pint sized ceramic snow covered village that lit up as if an entire glowing thriving town was miniaturized in the name of St. Nick. Our house was Christmas. It looked liked it, it smelled like it, it sounded like it and spirits were high, especially once Christmas Eve was upon us. My father prepared a ridiculously decadent Christmas Eve meal and before bed we prepared cookies for Santa served alongside a glass of milk, hung stockings, and my favorite part of the day was the final event. I call it an event because my mother reading out loud was a miraculous event. She read aloud magnificently, as if everything... be it a box of cereal or a street sign was a masterpiece penned by Shakespeare himself. She was a gifted, musical speaker and each Christmas Eve ended with her reading two books aloud. 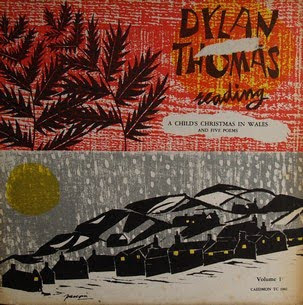 The first was The Night Before Christmas and the second was Child's Christmas in Wales by Dylan Thomas. My mother felt it went beyond the very notion of a holiday classic and according to her, it was the most perfect literary piece about Christmas known to mankind. Even well into my teens this tradition continued and ever since, no Christmas feels complete until I hear or read this classic Thomas piece. That being said the holidays now are especially difficult for me, mostly because my family as masters of the season, raised the bar for celebrating Christmas to an obscenely high unattainable level. My parents passed away this decade and with it all of their magical traditions and decorations evaporated. The only other family member who experienced an entire childhood based around these things was my brother Chris and he passed away 9 years ago. The inventors and my holiday partner are all gone now and while there are so many reasons to grieve for the lost of loved ones this time of year, it is this simple memory of a Child's Christmas in Wales being read by Mother while my Brother and Father sat near by that makes my heart ache the most. Luckily rather by accident I came across an LP of Dylan Thomas reading his story in a used bin of a record store a few years back. Having in my possession the author reading his own work by no means outshines the memory of my Mom's rendition but if there was a version to stand in for her, well this is the next best thing. I was hoping someone would have posted the Dylan Thomas version on Youtube but it isn't there however there I did find a version. The glorious song-like quality my Mother brought to the piece is missing but the wonderful words are still there. Tracy, thank you so much for sharing these memories. It's awesome to try imagining what it must have been like for you. My parents are really into Christmas too, and made such a huge effort to make it exciting for us every year. Thanks again; I love hearing about your childhood. I second everything Tess wrote; you wrote a beautiful expression of a beautiful memory, and I loved reading that. And I actually have a small idea of what you mean with A Child's Christmas In Wales, because that was always part of my family's tradition, too - it's such an amazing story of family history, traditions, and memories of magical times gone by kept alive through their tellings to younger generations, so how perfect that it shines amidst all the other memories of a time special to your family.